We can provide solution in Coral Stone, Keystone or Shell Stone for any project that require this material as the specs. We pride ourselves in giving the customer a one on one service experience and try to provide with solution that best matches the requirements of the project in hand. We are not limited to supplying Coral Stone tiles, pavers or pool copings, we also provided architectural solutions for high end projects nationwide. Our main goal is to become a “partner” to our customer for any particular project and provide an excellent quality material with the highest standard in terms of finish product and service provided. We are able to deliver nationwide. We also have the capabilities of delivering worldwide, with special services to the Caribbean Islands. If needed, within the Caribbean Island, we are able to provide installations services to our customers. Your One-Stop Caribbean Coral Stone Vendor! Coral Stone What Can you Achieve? Do you want to render a new look in your residential buildings or commercial establishments? If yes, consider using coral stone coatings in your architectural design. The use of coral stones in architectural landscape creates a traditional yet sophisticated look. Coral stone material in landscape and architecture renders a certain charm that could really capture the eye of even those who have no in depth knowledge in the principles of architectural design. LMT International sells, distributes and exports coral stone coatings, representing several factories and quarries in the Dominican Republic since 2005. 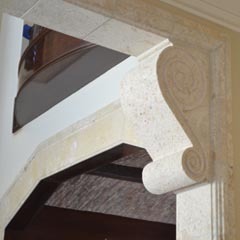 We offer the best selection of the finest Caribbean covering products available including Limestone Coralina (Coral Stone or Keystone), Dominican Travertino, Dominican Perlato, Portorro, Lajas, Marble, Shellstone, Gold Coral and many more. Our selection include pavers, pool decks, pool coping, blocks, tiles, flagging, veneer, balustrades, moldings, pool decking, landscape rocks, decorative stone and just about everything else for your walls, floor tiles, patio, pools and spa areas. Aside from providing such products we also help out in designing architectural elements for your building or renovation projects. We’ve exported coral stone tiles, pavers and other coral stone materials to countries like the United States, the United Arab Emirates, South Korea, Thailand, China, Canada, Uruguay, Poland, Puerto Rico and several Caribbean islands among others. So wherever you are, rest assured that we can deliver you the finest coral stone materials found in heart of the Caribbean. Click on any of the links above for more information and discover why we’re your one-stop shop for all your coral stone needs.